The walls in this store featured much more tightly spaced slats for the shelving, reflecting the need for Suncoast to have adaptable merchandising for both small and odd-sized items, none of which were particularly heavy. Additional miscellaneous merchandising kiosks sit in the back of the store. Once again, items that could at least have been liquidated are left to rot and await pre-demolition disposal. I was wondering that when I was out there a few weeks ago taking some shots here -- did they even bother to sell off all the good stuff that was still inside? I can see, the answer is NO. 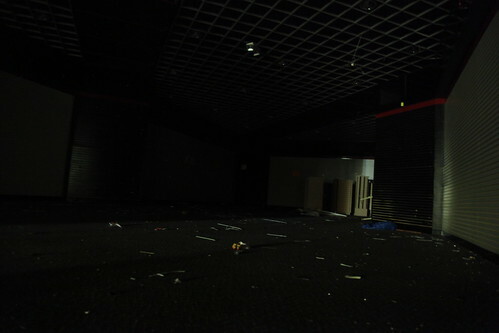 Even the dead Rolling Acres Mall near me had an auction to sell off all the usable things left inside!